Alright friends, I'm going to cut to the chase. 100% superwash merino wool - have you ever tried it!? Drop your hooks and go treat yourself to some right now, because I am here to tell you that it is soooooo nice to work with! When Red Heart asked me to participate in the Chic Sheep Designer Blog Tour, I was eager to try this new yarn and it did not disappoint! This triangle shawl is going to be a staple in my fall and winter wardrobe. I like to wear shawls as a triangle scarf, but you could also use this as a wrap as well. However you plan to use it, I hope you enjoy the Breckenridge Wrap! 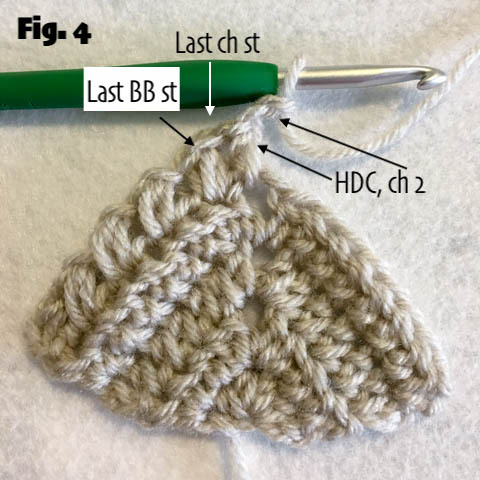 Keep reading for the free crochet pattern. Step number one in designing this statement wrap for my fall wardrobe was selecting my colors. I wanted something that was mostly neutral, but with a pop of color. I loved the pink coral color of 'Mai Tai' when I looked at it online, and it is equally lovely in person! That being said, Chic Sheep yarn comes in 24 different colors including brights and neutrals, so your color options are pretty much endless. Don't want to deal with color changes? No problem! 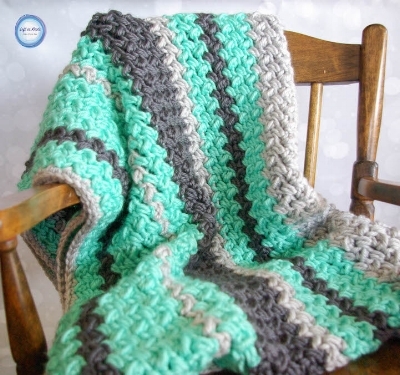 This shawl has so much texture, it would look beautiful in a solid color as well! 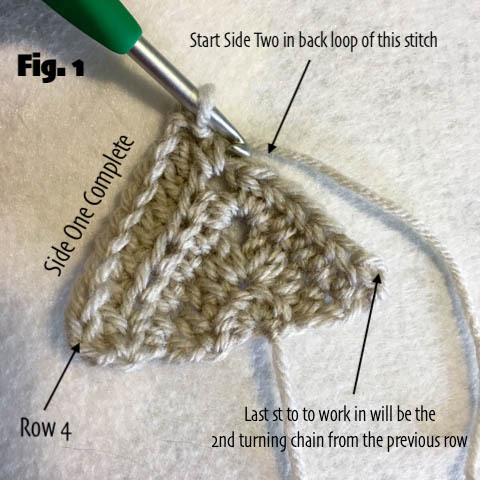 Ok, now you can pick up your hooks again and get ready to crochet! I can't wait to see what color combos you choose for your Breckenridge Wrap. Make sure to share pictures with me in my Facebook community group or on Instagram. Enjoy! 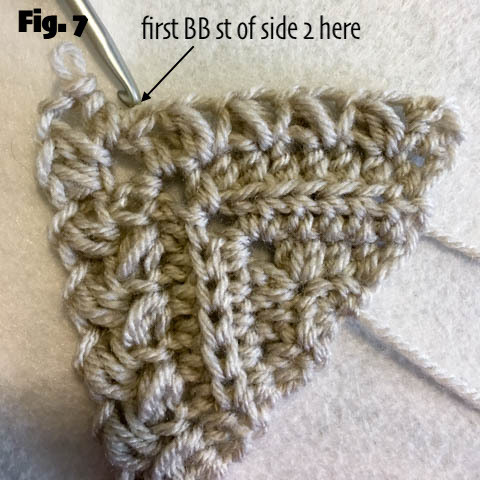 after Row 1, the number in ( ) designates the number of stitches per SIDE of the shawl (essentially half the row). That number does not include the ch stitches in the middle of the row. These sides will be referred to as ‘side one’ and ‘side two’. Color A = Linen, Color B = Lace, Color C = Mai Tai. Colors for a row are only indicated when there is a change from the previous row. Row 1: 5 HDC in the magic circle, pull tight. (5) Turn. 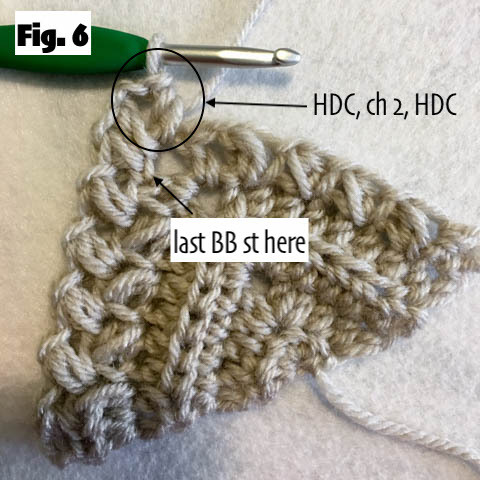 Row 2: ch 2 (remember this COUNTS as a stitch), HDC in the first st, HDC in the next st, (2 HDC, ch 2, 2 HDC) in the next stitch, HDC, 2 HDC in the last st of the row. (5/side) Turn. Row 3: ch 2, HDC in first st, HDC in each st along side one, (HDC, ch 2, HDC) in the ch 2 space from the previous row, HDC in each stitch along side two, 2 HDC in the last st of the row (7/side). Turn. Row 4 (Color B): ch 2, HDC in first st, BLO HDC in each st along side one, (HDC ch 2, HDC) in the ch 2 space from the previous row (Fig. 1, 2), BLO HDC in each st along side two, 2 HDC in the last st of the row (9/side). Turn. Row 5 (Color C): ch 2, HDC in the first st, *BB st in the next st, ch 1, skip 1 (Fig. 3), repeat from * along side one (Fig. 4), (HDC, ch 2, HDC) in the ch 2 space from the previous row, *ch 1, skip 1, BB st, repeat from * along side two, 2 HDC in the last st of the row (11/side). Turn. Row 6: ch 2, HDC in the first st, *ch 1, sk 1, BB st (Fig. 5), repeat from * along side one, (HDC, ch 2, HDC) in the ch 2 space from the previous row (Fig. 6), *BB st, ch 1, sk 1, repeat from * along side two (Fig. 7), 2 HDC in the last st of the row (13/side). Turn. Row 7 (Color B): ch 2, HDC in the first st, HDC in each st along side one, (HDC, ch 2, HDC) in the ch 2 space from the previous row, HDC in each st along side two, 2 HDC in the last st of the row (15/side). Turn. Rows 8-9 (Color A): ch 2, HDC in the first st, HDC in each st along side one, (HDC, ch 2, HDC) in the ch 2 space from the previous row, HDC in each st along side two, 2 HDC in the last st of the row (17/side, 19/side respectively). Turn. Row 10 (Color C): ch 2, HDC in first st, BLO HDC in each st along side one, (HDC ch 2, HDC) in the ch 2 space from the previous row, BLO HDC in each st along side two, 2 HDC in the last st of the row (21/side). Turn. Row 11 (Color B): ch 2, HDC in the first st, *BB st in the next st, ch 1, skip 1, repeat from * along side one, (HDC, ch 2, HDC) in the ch 2 space from the previous row, *ch 1, skip 1, BB st, repeat from * along side two, 2 HDC in the last st of the row (23/side). Turn. Row 12: ch 2, HDC in the first st, *ch 1, sk 1, BB st, repeat from * along side one, (HDC, ch 2, HDC) in the ch 2 space from the previous row, *BB st, ch 1, sk 1, repeat from * along side two, 2 HDC in the last st of the row (25/side). Turn. Row 13 (Color C): ch 2, HDC in the first st, HDC in each st along side one, (HDC, ch 2, HDC) in the ch 2 space from the previous row, HDC in each st along side two, 2 HDC in the last st of the row (27/side). Turn. Row 14-15 (Color A): ch 2, HDC in the first st, HDC in each st along side one, (HDC, ch 2, HDC) in the ch 2 space from the previous row, HDC in each st along side two, 2 HDC in the last st of the row (29/side, 31/side respectively). Turn. Row 16 (Color B): ch 2, HDC in first st, BLO HDC in each st along side one, (HDC ch 2, HDC) in the ch 2 space from the previous row, BLO HDC in each st along side two, 2 HDC in the last st of the row (33/side). Turn. Row 17 (Color C): ch 2, HDC in the first st, *BB st in the next st, ch 1, skip 1, repeat from * along side one, (HDC, ch 2, HDC) in the ch 2 space from the previous row, *ch 1, skip 1, BB st, repeat from * along side two, 2 HDC in the last st of the row (35/side). Turn. Row 18: ch 2, HDC in the first st, *ch 1, sk 1, BB st, repeat from * along side one, (HDC, ch 2, HDC) in the ch 2 space from the previous row, *BB st, ch 1, sk 1, repeat from * along side two, 2 HDC in the last st of the row (37/side). Turn. Row 19 (Color B): ch 2, HDC in the first st, HDC in each st along side one, (HDC, ch 2, HDC) in the ch 2 space from the previous row, HDC in each st along side two, 2 HDC in the last st of the row (39/side). Turn. Row 20-21 (Color A): ch 2, HDC in the first st, HDC in each st along side one, (HDC, ch 2, HDC) in the ch 2 space from the previous row, HDC in each st along side two, 2 HDC in the last st of the row (41/side, 43/side respectively). Turn. Row 70: ch 1, 2 SC in first st, SC in each st along side one, (SC, ch 2, SC) in the ch 2 space from the previous row, SC in each st along side two, 2 SC in the last st (141/side). Tie off and weave in all ends. Optional: make two tassels and attach them to each end of the shawl. I used Color B for my example.